First Venezuelan to show up in this blog... Mundial Zulia had a very potent signal a couple of nights in October 2005. I did wait a very long time before I sent the report though. A friendly email this evening from Héctor Escalante, Periodista, who finds it interesting that there are people around who monitor distant radio stations. Ole, takk for tipset!! KNRS was heard briefly on one half-hour on October 26 during a KVI fade. Although a 5kW night signal, only one of the lobes point north so it is not an easy to hear station with KVI and CKSW (and not least Greenland) on the same spot. PD Greg Foster confirmed my reception today. And a few non-IQ ones, though I haven't had time to check the recordings I made from the 746Pro and IC-7000. Two hours of monitoring resulted in these ID'ed or presumed stations. Some UNID signals were recorded for later analysis. KOVE-1330 and KIGO-1420 are new logs for me. Thanks Henrik Klemetz for helping me out with KIGO. Apparently they simulcast with KRXR Gooding ID 1480. The recorded RF on the IQ was 1325-1475 kHz. SDR-IQ Suitable For MW DX? Still "naked", i.e. without an enclosure, I tested the IQ last night as conditions towards North America were quite good. Also connected to my 175-meter beverage was an Icom IC-746Pro and an IC-7000. I started out late evening when European signal levels were rather high. Around 2230-2300 UTC one can hope for the first NA stations to fade in. For the first time I could actually see them before I heard them thanks to the waterfall display. First in with audio was WLQV Detroit MI 1500. At more or less threshold levels, there was no significant difference between the IQ and the 746Pro with regards to audio response. The 746Pro does have a warmer sound mainly because it has treble and bass controls but that was about it. The IQ's bandwidths provide excellent rejection of adjacent-channel interference. A few hours later after some sleep I programmed Spectravue to record RF from 1325 to 1475 kHz, autosplit into 1 GB (26 minutes) timestamped files. I recorded around two hours. As I am writing this at home, I am tuning around and finding commonly heard NA stations as WLOL-MN 1330, KRNT-IA 1350, WTAQ-WI and KRKK-WY 1360, KDTH-IA, KSUM-MN and KXTL-MT 1370, KOTA-SD and KLIZ-MN 1380 etc. etc. And one much less common, KIGO-ID 1420. Audio quality is excellent, both on AM and on ECSS for those stations close to European stations. In retrospect I see that a file size corresponding to 26 minutes is a bit too small. Maybe one hour is better - a bit over 2GB. Of course one could collect a full night's RF recording into one single file. There are pros and cons whatever you choose. The somewhat limited sensitivity I reported a few days ago does make some difference compared to my other receivers, but only when the signal levels are low; around and after sunrise. The IQ has not been calibrated since I got it. I will probably do so, but in my case there is very little to gain. It is very accurate. In fact, so many US and Canadian stations being slightly off their frequencies is a much bigger problem. SDR-IQ Suitable For MW DX? SDR-IQ Suitable For MW DX! My 10th Nevada verie, and a 100% reply rate. WLOL-MN, KWLO-IA and CJYM-SK are the dominating stations on 1330 up here in the Frozen North. WHBL has been heard quite frequently this season though, and a November 16 recording was sent to Kevin Zimmermann, Director of Creative Services today. Swift and friendly response from one of the station's veterans; he's been working with WHBL since 1976. Like I said in my previous post, I made a short (15 seconds) RF recording yesterday. Had a listen to it today. It is soooo cool to sit at home and tune around, change modes, bandwidths and display! I like it a lot. The picture shows a "Combo" (2D and Vertical Waterfall) display of the 100 kHz; I was tuned to JOIF Fukuoka 1413 khz when the screendump was taken. I recorded audio from the RF recording with TotalRecorder. Went like a breeze, similar to making a recording from a usual receiver. Right. So what have we got here then? First of all an exceptionally small PCB, measuring around 9 cm both ways. With a USB connector, a BNC Antenna connector and an RS-232 port. The thing is powered via the USB cable. More about the physics on RFSpace's homepage. My main concern was my local Loran C station. 14 km away, 250 kW ND, and my North America beverage pointing more or less at it. I had reason to worry. The Mediumwave band was literally filled with Loran C noise, while the other receivers (fed from the same splitter) had no problems - or at least not more problems than they've always had. Oh dear, oh dear. Shortwave sounded rather ok though. So how do we get rid of the noise? Well, reducing amplification is one simple way of dealing with the problem, so I reduced the IQ RF-amp with 10dB. That helped a lot. But made the receiver rather deaf (see sensitivity measurements below). Now, I have a couple of Loran C remedies at hand. One is a "Loran C Notch Filter" manufactured by the USCG Yard, recently bought from Dallas Lankford. It was exceptionally effective, and I could turn on the IQ RF amp again. But the filter itself has considerable attenuation, around 20dB on lower MW and 10dB on higher MW, so there is need for amplification. I put a 11dB preamp into the circuit, and it worked quite well. Then I remembered that I have in fact another 100 kHz/200 kHz notch filter around, made by Swedish DX-er Stefan Wikander several years ago. I replaced the USCG Notch with Stefan's. The result was excellent, and with no attenuation. So, at least for the moment, the Loran C noise problem is solved. So then. Sensitivity. How good is it? To be honest, I was disappointed. With full internal RF and IF amplification on, I found the AM, 6 kHz, 30% modulation sensitivity to be -101 dBm, or 2 uV. I only measured 1400 kHz and 10000 kHz but the results were identical and I don't expect the figures to vary a lot. Selectivity: Versatility beyond anyone's wet dreams. Up to 12.9 khz in SSB and up to 20 kHz in AM. Very, very effective, even compared to similar bandwidths in my IC-7000. Unfortunately no Passband Tuning, no Notch Filter, and a Noise Blanker that I haven't found anything to test on yet. User interface: No, no opinion yet. There is a learning curve to the software, Spectravue, and I'd like to see what it does and does not before I make a judgement. Not totally intuitive though, but it seems to have a lot of power inside for configurations and customising for the user. The IQ is easy on the PC. The PC I use is an almost 4 years old Toshiba Satellite with a 2.0 GHz Celeron CPU and 512 MB RAM. 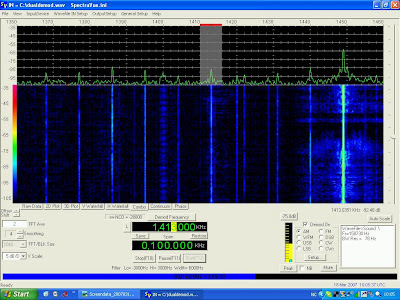 I thought it would prove to be too weak, but it appeared strong enough to record a 150 kHz span of RF data. I couldn't get it to take 190 kHz though but actually I didn't expect the 150 either. Enough said so far. During the 4-5 hours I've used the IQ, it has not powered down once, or disconnected or made any other unexpected twists. That is reassuring. The picture shows a "Screendata" centered on 680 where a very potent KBRW Barrow AK resided. On 675 we see an equal-strength NRK Røst, and my semi-local Radio Rossii Murmansk is the strong one on 657. I have made my first RF Recording, a 10 MB file (containing a few seconds of a 150 kHz span). Time for me to enter the wonderful (???) world of Software Defined Radios... A light wow: It is so small. I've seen pictures of it and knew it was small, but my imagination didn't grasp the true size of it. Just tested it in my noisy home with a small patch of wire connected to the center BNC, just to see if it works. It does. Loran C is very audible, as is local NDB "BV"-399, and the odd SW station. It will be connected to a beverage tomorrow. I hope to post an update by tomorrow evening. Prior to this season I hadn't heard KBSN with a proper ID even once... that changed dramatically the past few months as KBSN has become a common guest during west coast openings. I picked a recording from the best reception I had, on October 25, and emailed it to General Manager Jim Davis. A friendly and detailed response came today. Moses Lake has a lot of agriculture, especially potatoes, but according to Mr. Davis the city is growing also because web based companies are moving there. Moses Lake was renamed from Neppel in 1938 to honour the Kowalchina Indian Chief Sulktalthscosum, also known as Chief Moses. Read more in Wikipedia. KUKI, or what I believed was them, was heard rather late on October 23 during a west coast opening. I did not get a definite ID or slogan, but since the conditions were so geographically selective, I decided to send them a tentative report - something I rarely do. Email from Station Manager Tove Sorensen (a very Norwegian-sounding name but of Danish origin) confirmed that it was them. Tove runs a show on "The Country Station" KUKI-FM while KUKI-AM is Regional Mexican using the "La Maquina Musical" moniker. KUKI-AM programming is simulcasted on KLLK-1250 and KDAC-1230.